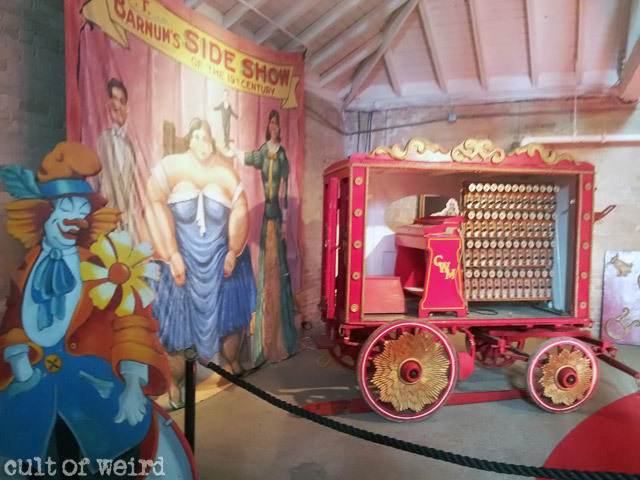 The Circus World Museum in Baraboo, WI immerses you in circus and sideshow history at the former winter headquarters of the Ringling. Bros. circus. Ringling Bros. 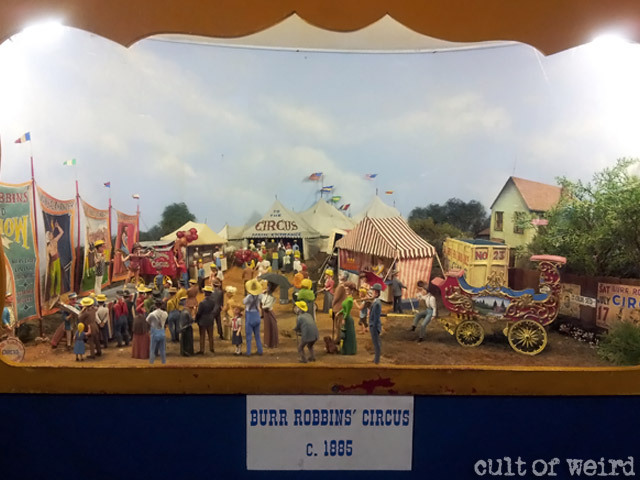 Circus was founded in Baraboo, Wisconsin in 1884. For thirty-four years it was the location of their winter quarters, where they returned at the end of the season. They relocated to warmer climates in 1918 due to the effects of the harsh Wisconsin winters on the animals. 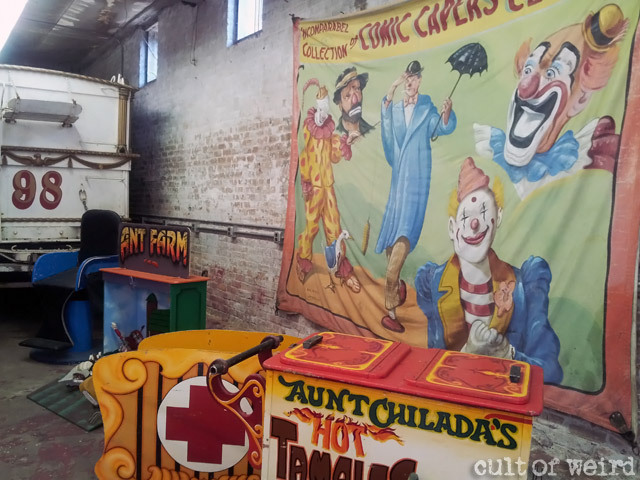 Those grounds are now home to the Circus World Museum, where the old buildings are now filled with calliope music and relics from the golden age of circus history such as sideshow banners, clown mallets, circus fliers and more. During the Summer season Circus World puts on two big top shows a day. The one-ring circus includes a variety of acts from dogs and monkeys performing tricks to the hilarious antics of Roger the Clown as he strives unsuccessfully to fill in for the trapeze act. A variety of other acts fill in throughout the day, including the wheel of death act, hands-on circus skills training for kids, an elephant show and performances by resident illusionist Tristan Crist. 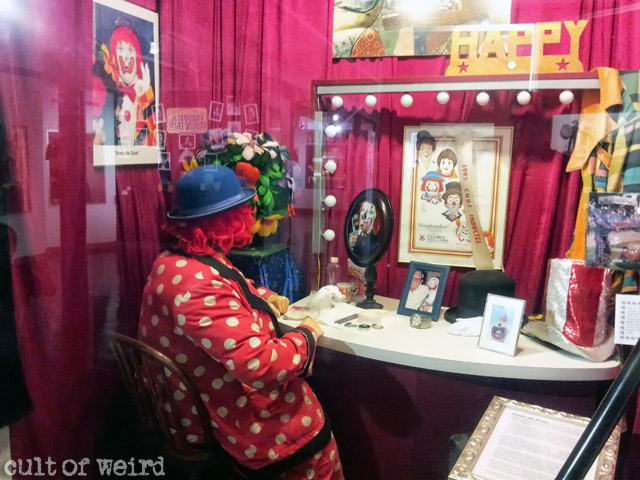 You are immersed in the wonder and opulence of circus history from the moment you step through the front doors. 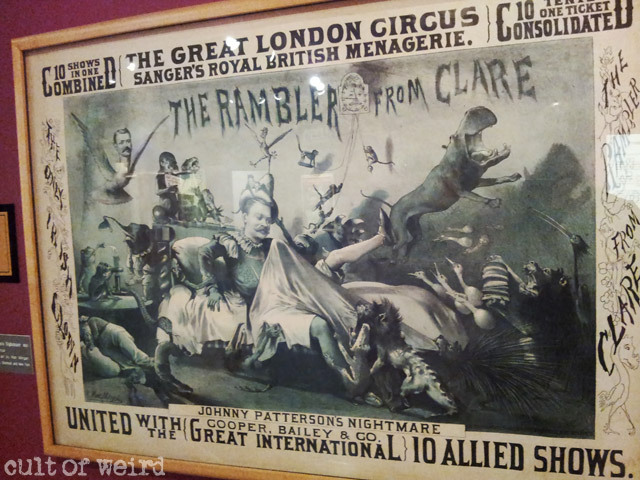 The walls are adorned with huge illustrated posters that once heralded the arrival of the circus, depicting animals and performers in lavish costumes and daring acts. 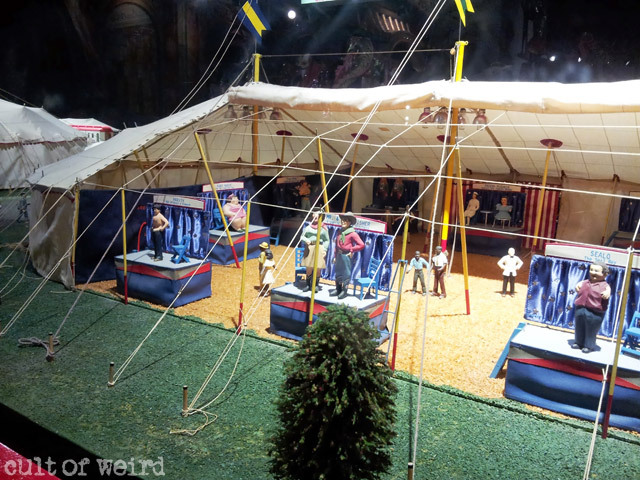 Sprawling dioramas with cut-away tents reveal the excitement of the circus experience in detailed miniature. 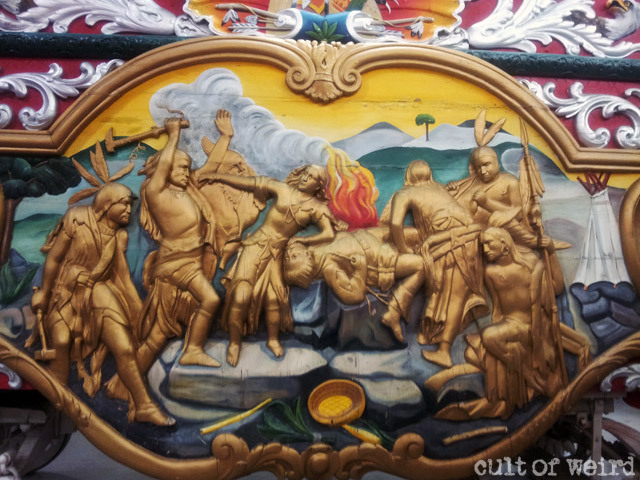 When the circus rolled into town, the ornate wagons extravagantly carved with mythological creatures and fairy tale scenes in gold and silver paraded through the streets with performers and animals to entice the locals. 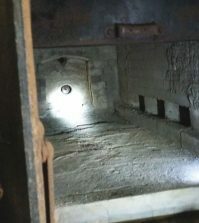 Of particular interest is the Snake Den, a glass-sided wagon built in 1902 which would carry the snake charmer with a huge, writhing python. 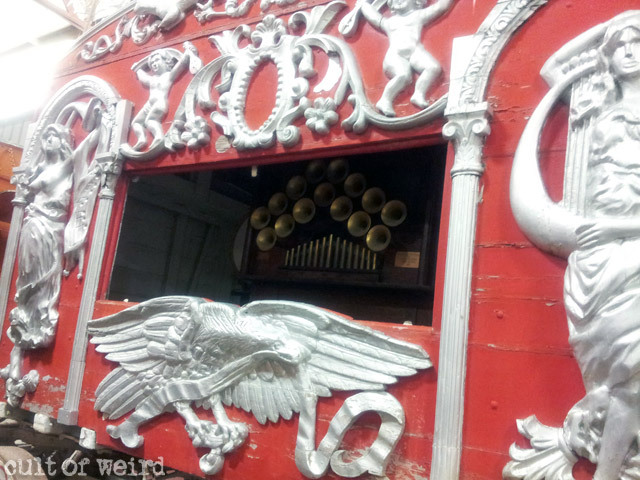 Circus World is home to two-thirds of the world’s remaining circus wagons, some of which were used in the 2011 film Water for Elephants. 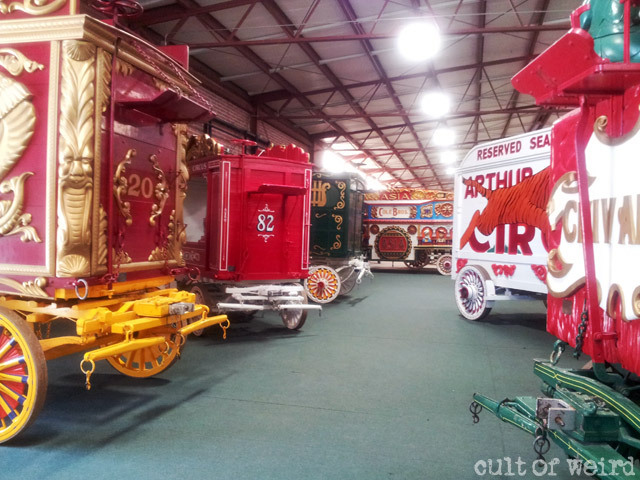 The on-site restoration center continually works to preserve the wagons and return them to their former glory. Pocahontas saving the life of John Smith on the Pawnee Bill Wild West Bandwagon from 1903. 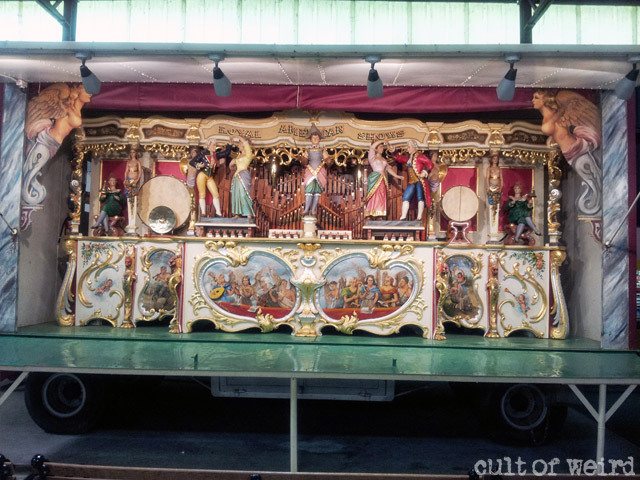 The 1905 Royal American Shows Gavioli Band Organ replicates the sound of an 80-piece band. 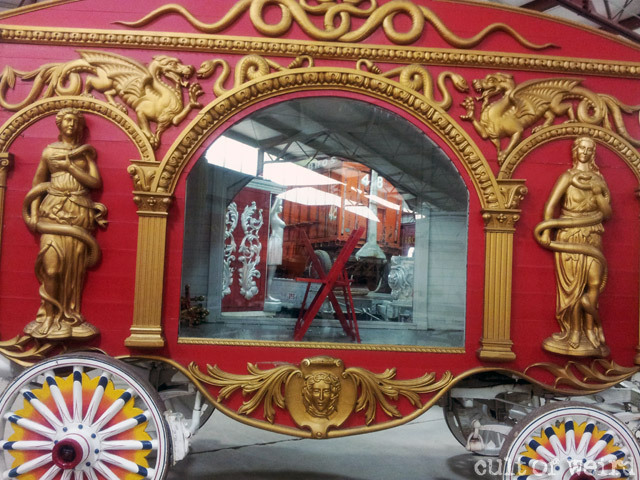 Ringling Bros. snake den circus wagon from 1902. 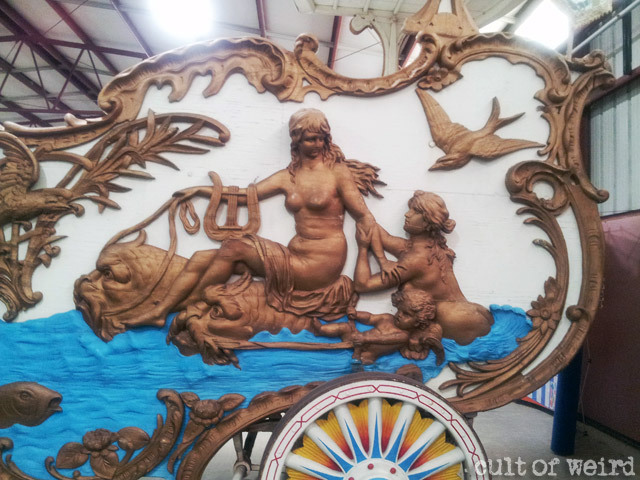 A goddess rides dolphins on the 1905 swan circus bandwagon. 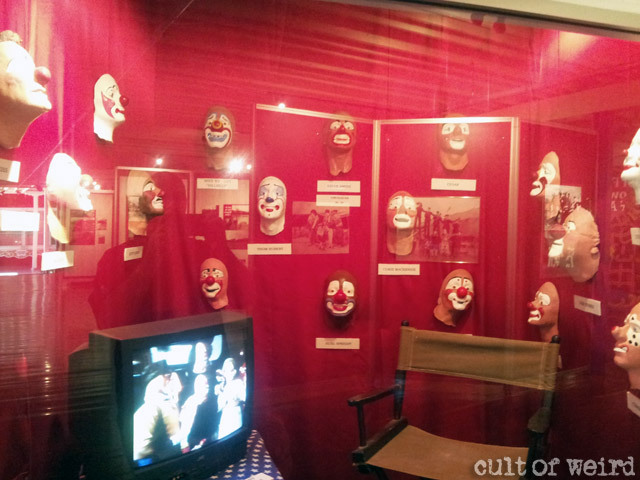 While Baraboo’s International Clown Hall of Fame and Research Center is not located at Circus World, there is plenty of clown history to be had in the historic barns, including a collection of over-sized clown mallets, a pair of huge antique clown shoes and a collection of what appears to be castings of famous clowns painted with their signature makeup. 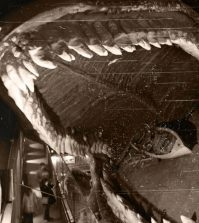 Vintage photo in the magic theater shows an illusionist sawing a woman in half. Tristan Crist’s magic theater is filled wall-to-wall with mystifying prints of vintage magic posters from the great illusionists of the late 19th and early 20th century – Kellar, Thurston, Alexander and Houdini. 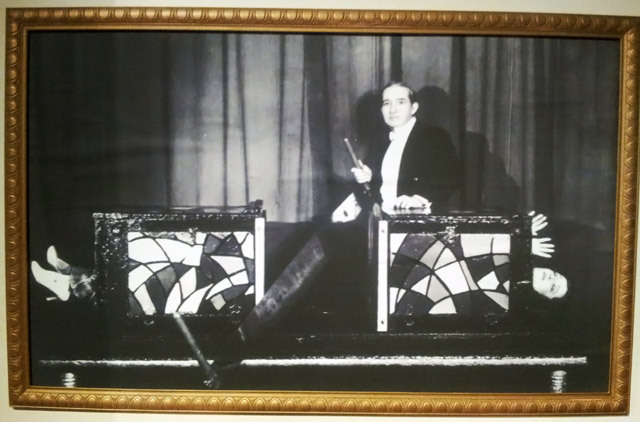 Crist performs an entertaining selection of traditional stage illusions such as walking through a plate glass mirror and compacting his lovely assistant into a one-foot square box. He also calls up kids from the crowd to help out, lending humor to some of the otherwise mundane tricks. The magic shop includes a signature Tristan Crist magic wand and magic trick kit if you are having a mid-life crisis and looking for a career change. Crist’s performances runs all year. 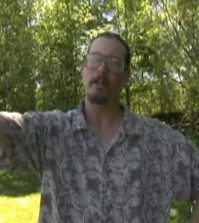 He guarantees you’ll see something new each time. 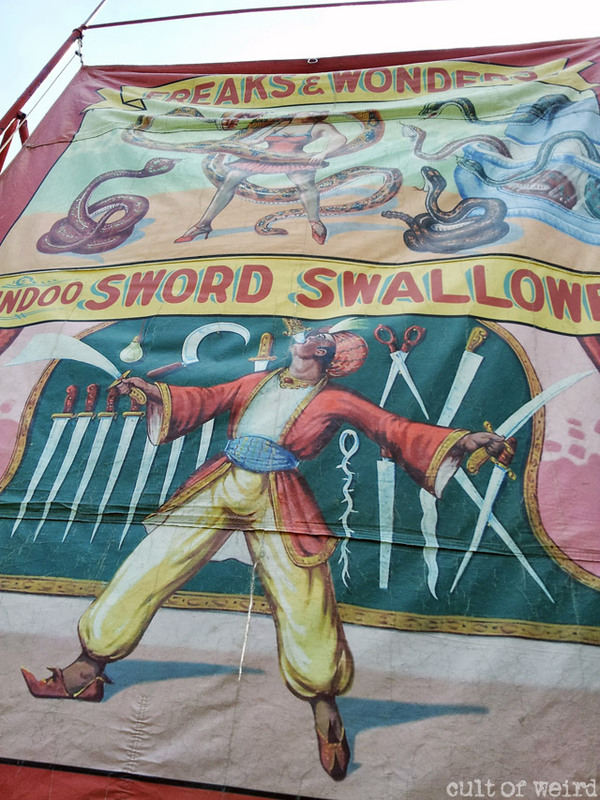 The Circus World sideshow lies beyond the towering banners painted with irresistibly lurid acts. 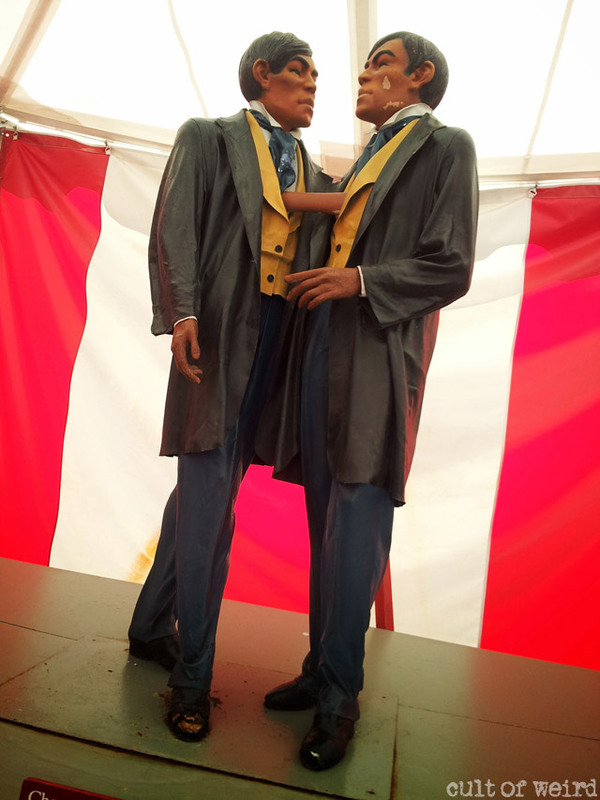 The red-and-white stripped tent contains life-size statues of freak show staples such as the fat lady, bearded lady, snake charmer, sword swallower, tattooed woman, dog boy and Siamese twins Chang and Eng. 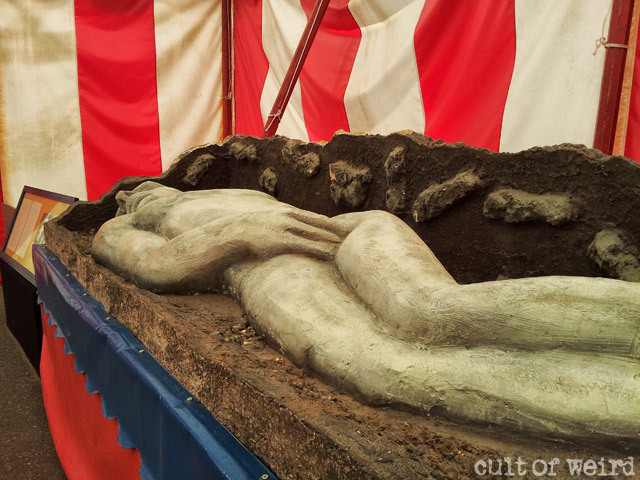 A replica of the infamous Cardiff Giant pays tribute to the sideshow’s long history of gaffs, hoaxes and controversy. 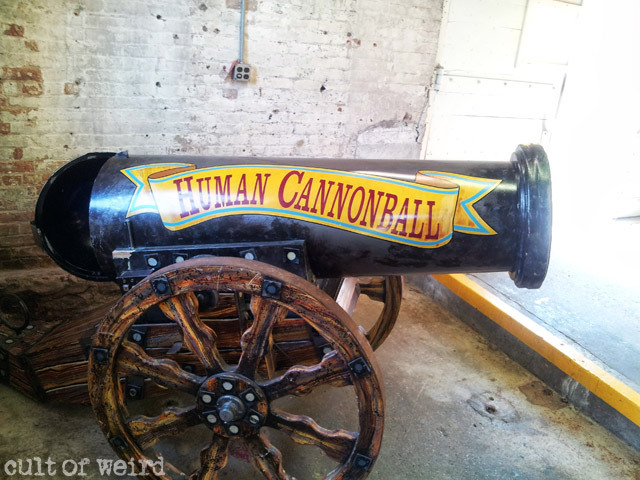 The idea was conceived in 1867 by a Baraboo man by the name of George Hull. He wanted to bury something near by, then return a year later to “discover” it, sensationalize it, and get rich exhibiting it around the country. Hull moved to Chicago in 1868, where he hired a sculptor to carve a man, complete with large stone genitalia, out of a 12-foot long block of gypsum. 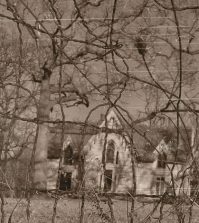 The hoax was then carried out on the farm of his cousin William Newell in Cardiff, New York. Some experts believed it was a giant petrified man, others saw it for the fake it was. P.T. Barnum offered the men $50,000 for the giant. When they turned him down, he just made his own. 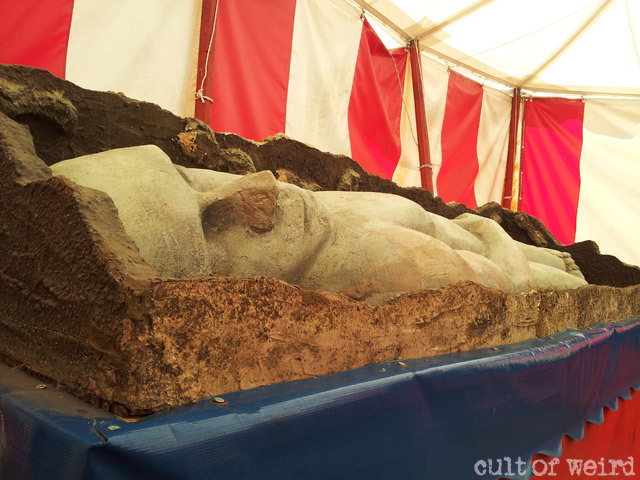 If you are bringing the kids, don’t worry…this Cardiff Giant has been castrated. Circus World is about 20 minutes from Wisconsin Dells, the weird oasis in the middle of Wisconsin’s desolate rural wastelands. 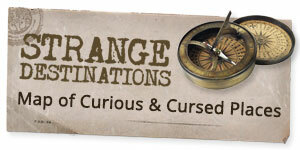 For up-to-date info and schedules check out the Circus World website right here. This is so cool!! It has been added to my bucket list!